Wasn’t production very challenging in connecting all the maps? Usually, you would break it down one by one. That way it’s much easier to make. I wanted to do it no matter what anyone said. Of course, there was a lot of opposition from designers and whatnot, but Takemoto-san said, “No, this is important this time,” and that strong will lasted to the end, so the team eventually came together as one and gave it their all. And it was worth it, right? Oh, yes. The final goal this time is Princess Peach’s Castle, and you can see that it is the goal from anywhere, so you think, “I’ve come about one-third of the way,” and when there’s a fork in the road, you look out over all the landforms and think, “Which way shall I go?” That kind of worry is fun. Asuke-san focused on camera angles at each point that would allow you to see the next course. He really dedicated himself to it. And this map relates to features of Miiverse.1212. Miiverse: A network service, integrated with the Wii U console at the system level, that allows people all over the world to connect through their Mii characters and more fully enjoy video games. I worked on Miiverse. We made it so that word bubbles display over the map, and you can write comments. Connecting the maps into one and being able to look over all the courses played a big role in making that happen. Oh, I suppose if they weren’t connected into one, you couldn’t have displayed it like that. 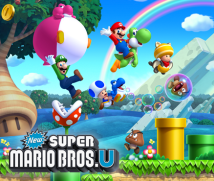 We basically leave it up to each game on how to handle Miiverse, but in the case of New Super Mario Bros. U, your location shows up on the map and you can display your posts. What did you think of for having Miiverse integrated? I had heard that the key word for Miiverse is “empathy,” so first I thought about what makes you experience empathy and want to post. I’m not very good at action games, so I mess up at the same spots over and over again. Yeah. (laughs) I think that’s the time you get emotional the most and want to tell people. And when you clear something really well or do something special to clear a course, you want to convey that happiness to others. I thought if I posted when I felt like that, a feeling of “I was like that, too” would lead to empathy. I tried to make it so that the game would encourage the player to do so. And you can submit handwritten posts to Miiverse, so those emotions come across even more fully. That’s right. Being able to submit handwritten posts weren’t part of the plan at first.1313. 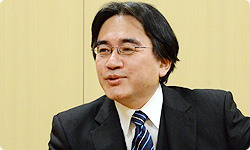 They weren’t part of the plan at first: For more about the development of handwritten posts, see the session of “Iwata Asks” with the developers of Miiverse for the Wii U console. Also, you can read Miiverse comments on the Wii U GamePad in your hands. Originally, when we displayed Miiverse on the television screen, lots of word bubbles appeared and it was difficult to see what was what. The word bubbles got in the way. But we wanted them to read messages of empathy right away. Then we made it so that only the Mii character’s face would appear on the television screen. Then you would know someone was saying something. The Wii U GamePad shows pretty big letters, so you can read the comment right in your hands . Reading text is easier in your hands. That’s right. And it’s great how you can read them without even pressing a button. Also, you can see a little bit further on the screen in your hands than on the television screen, so the Wii U GamePad is better for seeing what’s up ahead. And if you still can’t see, you can easily scroll by touch control. You might think that the television screen and Wii U GamePad always show the same things, but that actually isn’t true. Yeah. The map screen is different, so the maps are much handier this time. In that respect, I suppose Wii U knowhow on how to utilise the two screens will build up. Yeah. I’m sure of it!